One of my first NO tapes! I remember watching this video on The Music Box (or similar channel) and "taping" it with a microphone in from of the tv speakers...! Good times! Looking forward to the new version, though! you sir, are a magician. these stash remasters sound amazing. thank you. 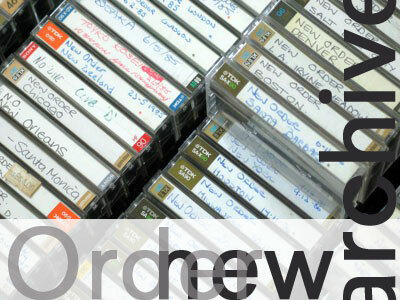 You would have to ask the fella behind new-order.se as that's where I got the sleeve from. The actual Low-Life font, and that used for the blog header image, is Neuzeit. thank you. that's what i wanted. Hey Man, would it be possible to convert these to MP3 for you and host them on my blog? I got my own server. I'll give you kudos/credit/whatnot, I just think that there are a lot of people out there who want the MP3s but don't have the time/patience to convert them. Love what you're doing, keep up the good work. Why convert them to shity mp3's ? I just don't get it, flac is the best quality and should be the standard of everyone. Well, iPods for starters. Plus countless other programs/devices that don't run FLAC. And even if they do, my android tablet has 8 gigs of storage, I kind of need the space. Finally, most people using most equipment simply can't hear a difference between high-quality 320kpbs MP3s and lossless audio. It's my blog, I chose to upload FLACs. I am an archivist. Archivists don't rely on second-source copies; they root out the best original source. Along those lines, mp3/mp4/wma etc are, at best, "xeroxes" of the original source. I'm putting all this work in for my personal enjoyment, and decided - out of my own generosity - to open my work up to fellow fans. I can no more stop you from doing what you wish with these files than I can un-leak the masters from the band's lockup. But I would hope you would respect my wishes and not spread these in a lossy format. I understand people want to listen on various portable devices. I myself convert these to mp3/m4a and do my daily listening on my iPhone. But I convert from the lossless files, and the lossless files will always be there as an archival format. There are easily hundreds of freeware or cheap shareware programs, for all common platforms (Mac/Win/Linux), that cross-convert dumbly between formats. Most are as simple as "right click, pick format, add to iTunes" or what-have-you. We live in a society, at least in the West, where the vast majority have access to broadband internet. Very few of my readers are browsing my blog on their trusty 56flex modem - and if they are, I think downloading FLACs are the least of their concerns. I am choosing not to bow to the lowest common denominator; if you want the files, the beautiful musics, you will find a way to download and access the sets. just wanted to say thanks for your dedicated work. Really sounds wonderful. Thanks for all the time and hard work. Thanks for all of your work on these. I appreciate you're busy putting all the links back up, but thought I'd mention that only parts 2 & 3 are available here. Any chance of getting part 1 back? Thank you! BTW, link 1 was available and worked just fine for me. This sounds kinda weird when you're used to a mono recording ripped from the video of this gig :). Question: what happened to the running order? On my video rip Age Of Consent is played after Perfect Kiss while this recording plays AOC before PK. Someone kind to hand me a link for this one ? I've missed it.